In any normal year, a low number of posts would be a bad sign for my time on the water. For 2016, the lack of posts has actually been the result of more time on the water. Busy is good if you ask me. Busy is better when it involves setting a new personal record for days on the water in one year. My goal for next year is to pass 200 days on the water. That includes fishing and guiding just to be clear. While 2016 was a phenomenal year for me as far as guiding goes, the focus of this post is on my own fishing adventures. 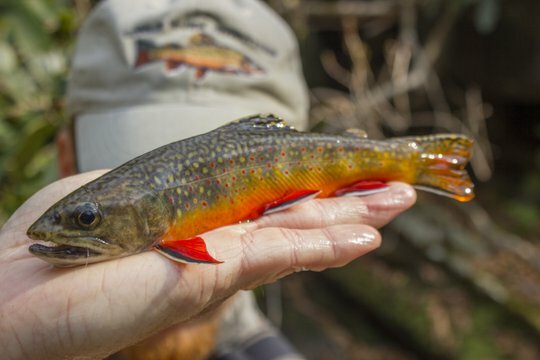 While I'll throw in a tease or two from my work, check out Trout Zone Anglers and the blog there for a complete year end summary of the guiding for the year. That post should be up in a day or two. My own fishing for the year started off in early January. 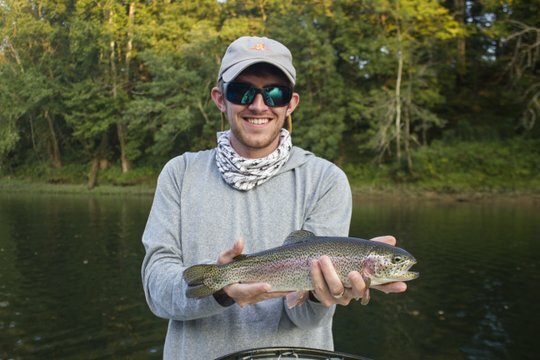 One of my favorite days on the water that month was spent in the Smokies. No big surprise there I know. 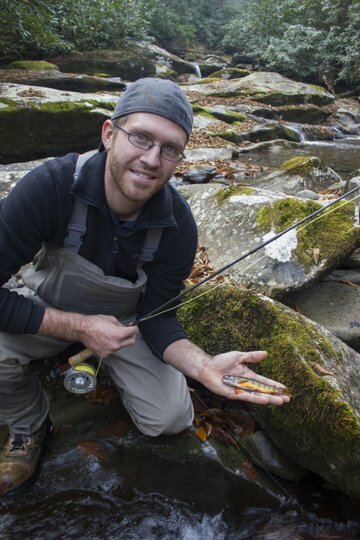 The day was particularly memorable because of the nice brown trout I found. 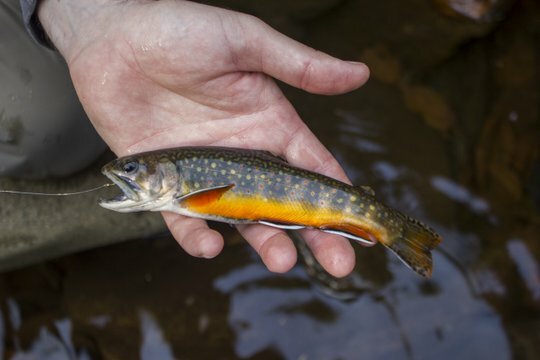 Late in the month, I would spend some time fishing for brook trout with the idea of trying to catch one each month of the year. That worthy goal would sadly not be met, but hopefully I'll have plenty more years to try it. February was an unusually slow month for me. I didn't get out much although the local farm ponds did keep me from going crazy, and the chance to solve an interesting fishing riddle was as much fun as anything. 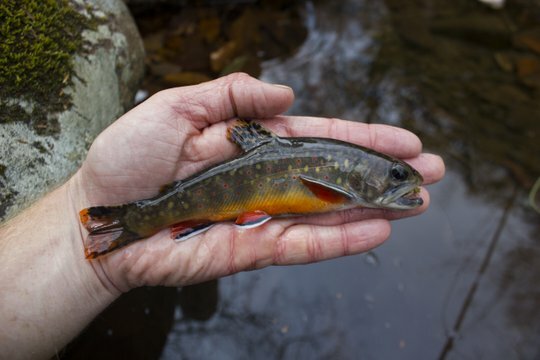 Being a leap year, we had an extra day available and I made the most of it to keep my brook trout streak going. Ironically, I kept the streak going for the two toughest months of the year before it fell by the wayside. March was more or less a normal month and included the beginning of my spring trips down to the Hiwassee that I try to squeeze in every year. 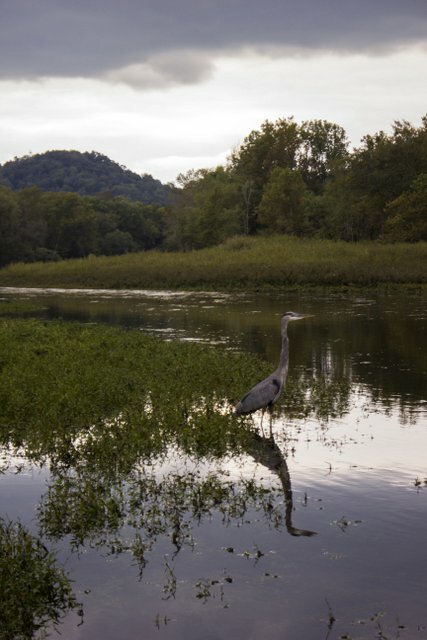 The change of pace this year included my increasing trips down to the Clinch River. Some nice fish were caught and I began to appreciate this unique tailwater more and more. April saw the fishing action pick up significantly. In addition to trout, smallmouth bass were becoming quite active. 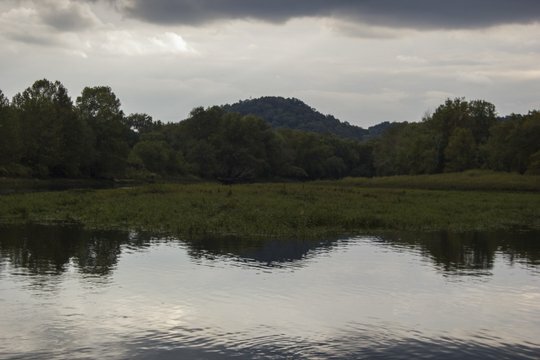 A new favorite trip was born that featured stocked trout in the upper reaches (that we never actually caught) and smallmouth and musky throughout the rest of the trip. I was fishing with my buddy David Perry. With both of us spending so much time guiding, trips together have been fewer as of late, but this is a spring trip that I hope to do again many times. I hit the jackpot in May when I was able to fish one of those cloudy days that threatens rain. The bugs poured off. The trout rose. The angler was happy. In prior years, I tended to hit these great days when I was guiding, and that is a good time to guide. 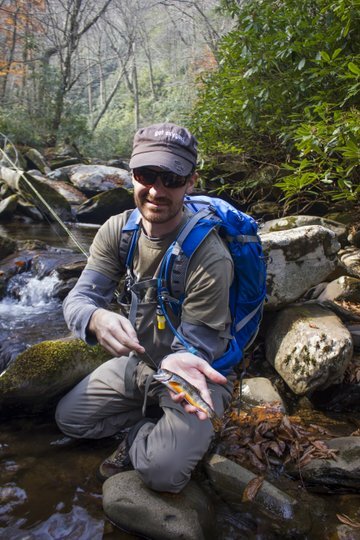 I'm always super happy when I can show someone a legitimate hatch in the Smokies, but I like to fish it myself as well on occasion. Somewhere in late spring or early summer, I found myself the owner of a smartphone due to the generosity of a friend. If that hadn't of happened, I'm sure I would still be enjoying my old flip phone. however, since I did have a smartphone finally, I decided to embrace everything about it and started using Instagram. If you haven't been there yet, there are a lot more pictures there then you will find here including a lot from my guide trips as well as my own fishing excursions. Be sure to follow me there as well as on Facebook! 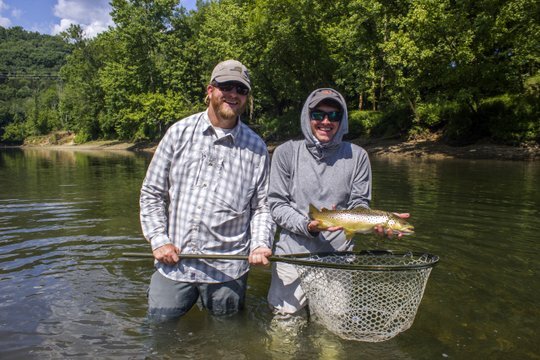 July was hot, but the river continued to fish very well. In fact, it just kept getting better as the summer wore on. Smallmouth bass were also active and I made a trip I've been thinking about for years. My friend Mark Brown from Chota and I met up for a truly epic adventure. 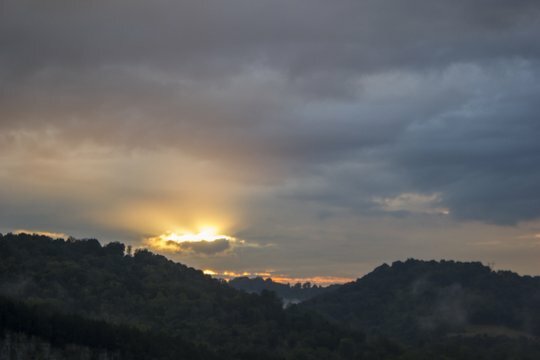 I saw my first live rattlesnake on the Cumberland Plateau ever on that trip and was so surprised I forgot to get a picture. In between bee stings, rattlesnakes, and copperheads, we did manage to find some great smallmouth. In August, I started things out with more big backcountry smallmouth bass. 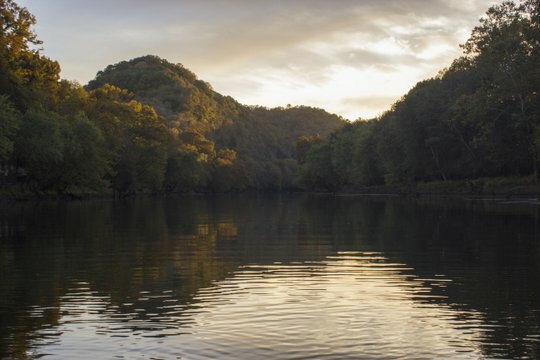 By this point, the Caney Fork was fishing so obviously well that it was hard to keep me away. I was spending more time on the river than anyone really deserves to spend fishing. 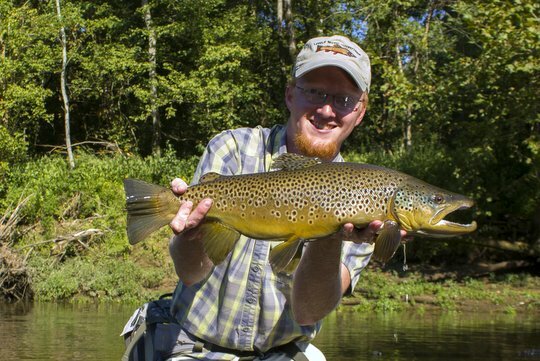 It began to pay off finally with some great brown trout, culminating in my personal best brown trout from the Caney Fork River. I caught the fish while sight fishing with a midge and after locating it a couple of days prior on a guide trip. There are some perks to guiding other than just spending time outside every day and one of those is locating great fish! In September, I did another summer trip I've been considering for a few years. It turns out that it was as scary as I had anticipated and then some, but it was nice to do it once in my life at least. From now on, that will be a winter only trip. October and November were both great months, but the high points of the year had already passed from a fishing perspective. The one exception to that was a trip with my cousins to camp in the Smokies that was one of the best of the year. We fished all over, caught some nice brook trout, and relaxed. 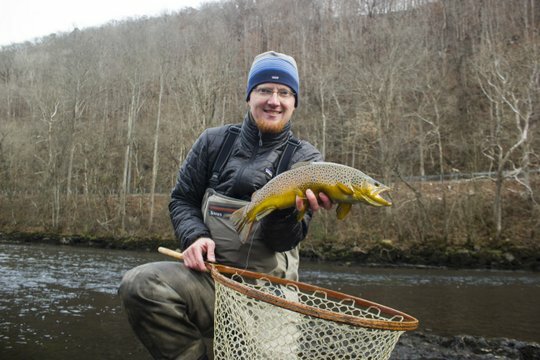 I still caught plenty of big fish and that continued into December with a special brown trout on the Clinch River. The wildfire that affected portions of the Great Smoky Mountains and Gatlinburg is already receding into memory for most people. Unfortunately, for those more directly affected, it will take a lot longer for things to be normal again. While the people who tragically lost homes and businesses and even loved ones have suffered the most, the landscape also suffered in the short term. Portions of the Great Smoky Mountains National Park above Gatlinburg will probably be quite different for some time to come. These are the areas where the fire burned the hottest on exposed ridge tops where the wind conspired to do the most damage. Thankfully, portions of the streams that we all know and love, while affected, are mostly not as damaged. There is damage, and the hardest part will simply be in waiting to see when we'll be allowed to fish these waters again, but overall it appears that the streams were spared the brunt of this fire. Until then, we can only remember the good times that once were. 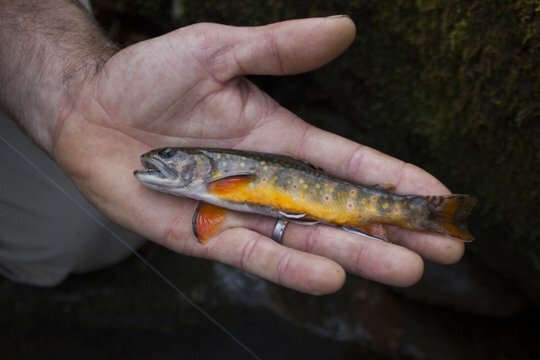 One of the more popular brook trout streams in the Park is near the fire's origin. 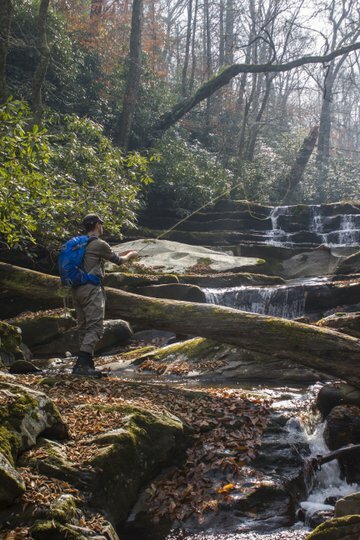 This is a stream that I had the good fortune of fishing with my cousins back in early November. The air was already hazy from the burns over in North Carolina, but we still enjoyed the opportunity to get out on the water and enjoy the late season warmth. 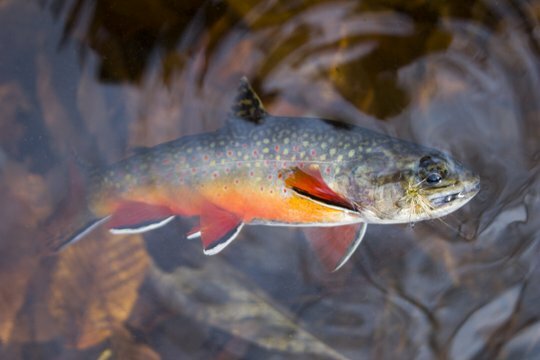 Some of the most beautiful fish you will ever find are brook trout in their fall dress. Here are a few photos from our day on the water. Hopefully these jewels survived and will continue to do so as they have for many years. 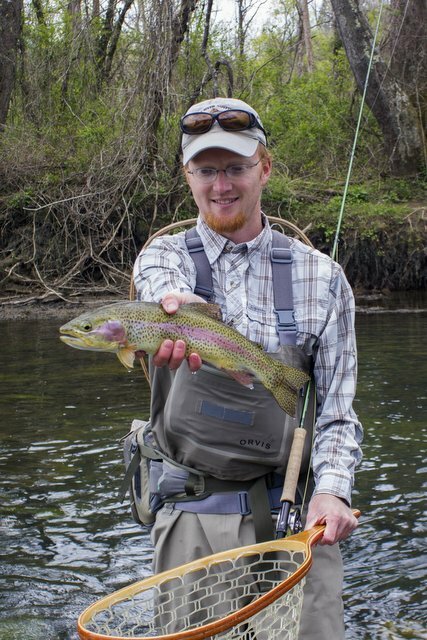 For more on this trip, check out this full trip report I did over on the Little River Outfitters message board. 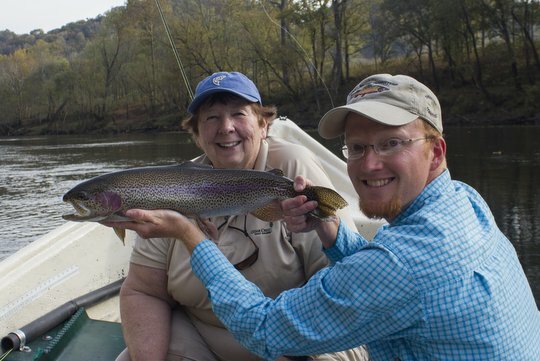 This past Friday, I had made tentative plans to fish on the Hiwassee. By Thursday evening, I was having second thoughts. 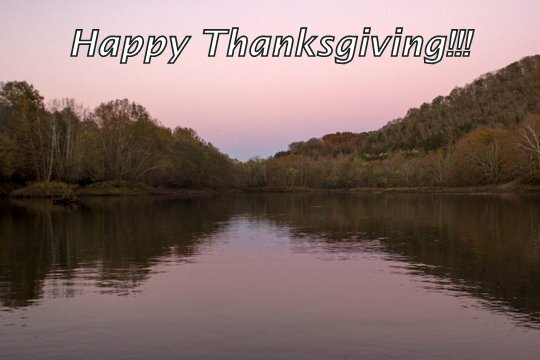 The Clinch River was my second choice so plans were changed. The forecast high temperature was 41 degrees which is not bad by winter fishing standards. When I got up on Friday morning, I was excited to get going. My last trip to the Clinch had been very memorable, and I was hoping for a good encore. The drive over set the stage for what would turn out as a very cold day. The sky had a solid gray mass of clouds from one horizon to the other. The sunny skies that were forecast never materialized which kept our temperatures from reaching the forecasted highs. When I got to the river, it was 28 degrees. Not the coldest I've fished in, mind you, but cold when you aren't mentally prepared for the occasion. The water was still running from the generators when I arrived at the Clinch River, so I took a brisk walk up and down the river. My scouting trip upstream was successful, and I headed back to the car to rig up. Big fish, including some nice brown trout, had been located and there was no time to lose! At the car, I looked at a couple of options and settled on my 9' 5 weight Orvis Helios fly rod. A dry fly with a tungsten bead head midge dropper seemed appropriate. The fish I had noticed were eating and the likely food of choice was midge larva or pupa. This is probably my favorite sight fishing rig for large trout on tailwaters. The dry fly makes a perfect subtle strike indicator, while the midge is a food organism that is prevalent on all tailwaters and most freestone streams as well for that matter (hint hint). Walking up to where I had found the fish, I arrived as the water started dropping out from the generation. Fish were moving back and forth, enjoying the bounty of the river while there was still enough flow to keep them active. 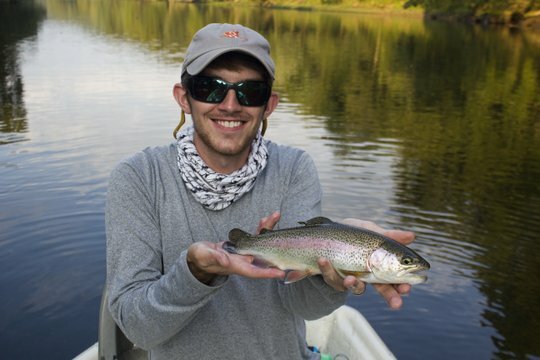 It took three casts before a nice rainbow trout took the midge. The fight was over quickly. Even though I was fishing 6x tippet, the Rio Fluoroflex Plus held just fine. I took a quick picture and short video clip of the release, and then it was time to fish again. Despite persistence, I eventually gave up on finding more willing fish. Besides, the wind had started blowing which left a chop on the surface of the water that was nearly impossible to see through. I headed downstream to a section where, although I had not spotted fish there earlier, I was confident that the fish were there. 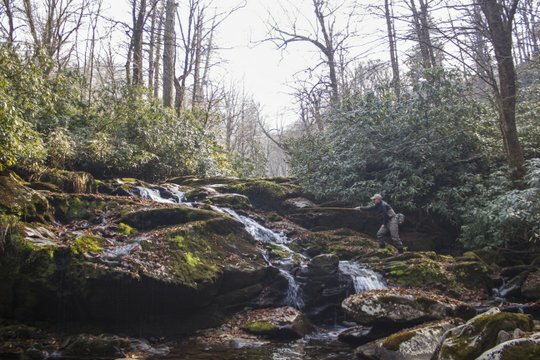 Sure enough, when I started walking slowly through the section, I saw nice brown trout holding in deeper pockets and runs throughout the section. In all honesty, a deeper dropper would probably have been more effective, but it was still below freezing and my fingers were doing good just to cast the fly rod. Every few casts, I would have to chip ice out of the line guides or dip the rod tip in the water to thaw them out. In other words, classic winter fishing. 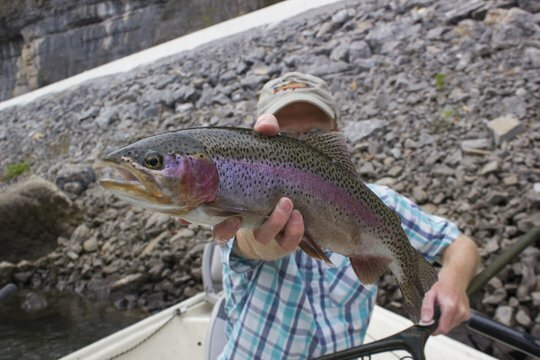 Here in Tennessee, we only get to enjoy this type of fishing a handful of times each winter. The great thing about living here is that there are plenty of warmer days throughout the winter which are comfortable enough to fish without a jacket. Despite my early confidence, the fish didn't find my midges irresistible. I did miss one or two large brown trout due to operator error. In other words, I didn't set the hook effectively. I'll blame the cold weather. By this time, other sections of the river were starting to call me, so I started the trek back to the car. Along the way, I fished a few choice runs. I was about to reel it in and just walk back when I saw a nice fish in a shallow riffle feeding heavily. Then I noticed another. Both fish were tucked into slightly deeper pockets and were moving quickly back and forth as they fed on midges. I cast at each one in turn and ended up spooking both. Right as I made my last cast, the indicator (I had switched rigs at this point) twitched and I set the hook...on a monster. The little three inch trout darted this way and that. I was about to simply lift the fish out of the water too unhook it when a shadow came up behind with jaws open. The little fish ran this way and that trying to avoid its fate. Without even thinking, I dropped the rod tip so the fish had room to finish their uneven duel. It didn't take long. 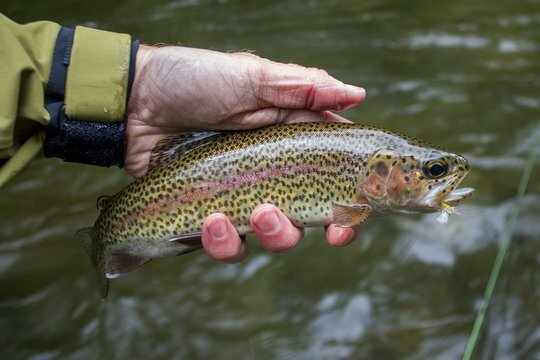 The large fish crowded the little rainbow up into the shallowest part of the riffle before eating it. I waited enough time for the brown trout to secure its prize before giving tension to the line again. The fish simply sat down on the bottom of the riffle and would not budge. I've had this happen before. Usually it turns into a tug of war where the larger fish eventually spits out the smaller one or gets snagged on a trailing fly. On this particular fishing trip, I was in for a curveball. Slowly I worked the fish up to the surface and started sneaking closer with the net out. I was hoping to net both fish at the same time. 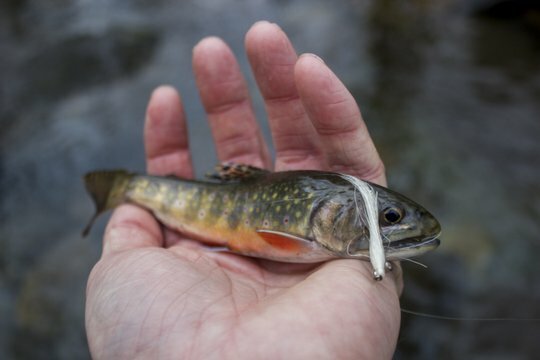 Suddenly, as I snuck closer, something slipped and I saw the little trout escape the large brown trout's mouth. The surprise was that the line was still heavy. When I gave a little pressure, the big fish took off. My midge was securely stuck in the corner of his mouth. That was a new one for me. 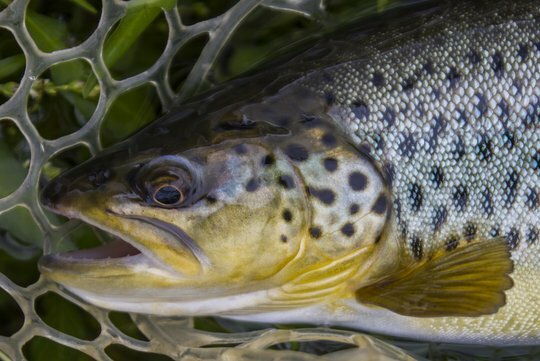 I worked my way downstream, following the heavy brown trout until I was within range with my net and quickly scooped. 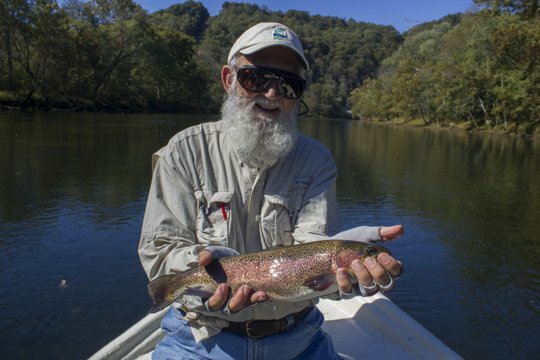 My accidental and brief foray into bait fishing on the Clinch River was quite successful if I do say so myself! 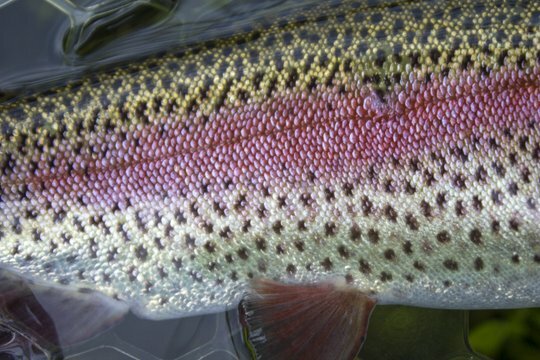 Lots of changes have happened with the Trout Zone Anglers website. If you remember back, I introduced a new website several months (okay almost a year) back. That was an experimental site that allowed me to get up to speed on the new platform (Wordpress) and get the basic site set up so I would have minimal downtime. Fast forward to today and I'm happy to announce the new website. The basics of the website are complete, but the site is far from being done. 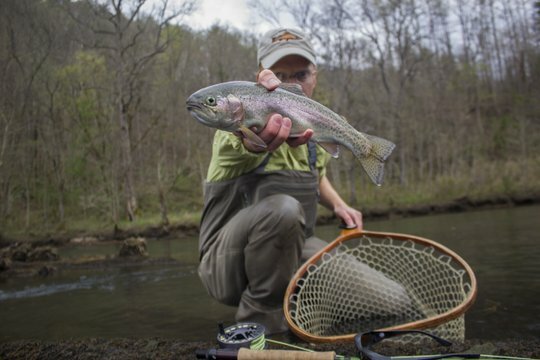 Check back often for fishing guides to many of the streams, rivers, and even lakes across middle and east Tennessee. Eventually those guides will probably even include destinations further away. 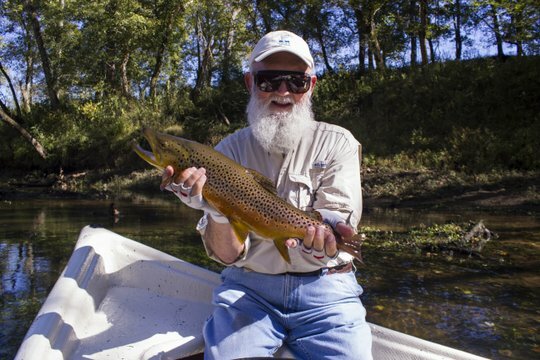 Of course, you can also find information about my fly fishing guide service on the new site. One thing I would highly recommend is subscribing to the Trout Zone Anglers email newsletter. Go to the new website link above and look at the right sidebar for a signup form. Simply add your email and name and hit submit and you will be good to go. Lots of extra content comes through the newsletter that does not show up here. One of the crazier fishing trips I've taken this summer happened just a short week or so ago. Now, I know I've already taken some crazy trips this summer. The thing about this trip is that it was not intended as a fishing trip, but like a good angler, I decided to carry a rod. One of my Tenkara rods seemed like a good idea. This trip came together quickly at the last minute when my brother-in-law was visiting. 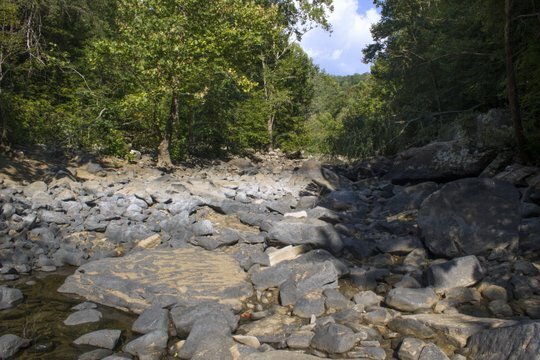 We wanted to visit a local river system that has large sections that go dry in late summer. 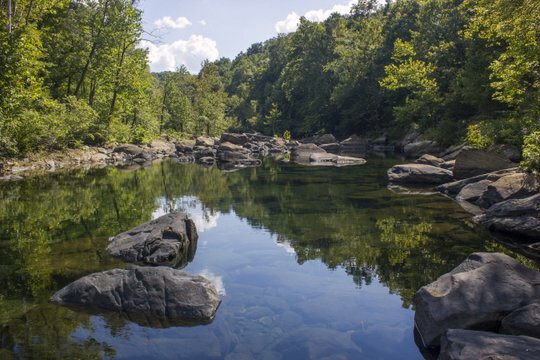 The upper Caney Fork River is somewhere I've never been in the summer to see it dry but have seen it flowing full in the cooler months. This would be one of those rare once in a lifetime trips, but we didn't really know that going into the trip. That Sunday morning, after a hearty breakfast that included breakfast burritos, we threw some food and water into our daypacks and hit the road for the drive to the trailhead. I was also carrying my good camera, a water filter, and some other odds and ends just in case of an emergency. The first mile or so of the trail led through a nice wooded section with a good clear trail. By the time we were getting to the two mile mark and beyond, the grass and weeds were taller than was ideal. Both of us started watching carefully for snakes while thinking nervously about ticks and chiggers. Surprisingly, we didn't notice any of those critters until our first stop. I say surprisingly because it was such good habitat for all of those. The first stop was at Screw Cliff Overlook of the river gorge that I had stopped to eat lunch when I last did this hike last winter. I was starting to think about food and definitely needed a water break after walking two and a half miles in the late summer heat. My pack slid to the ground and I quickly went to the edge of the overlook to check the rock overhang below for snakes. Sure enough. My first thought was that they were copperheads, but I didn't linger long enough for a positive identification. Tim, my brother-in-law, came over and looked and decided quickly that they were something else. 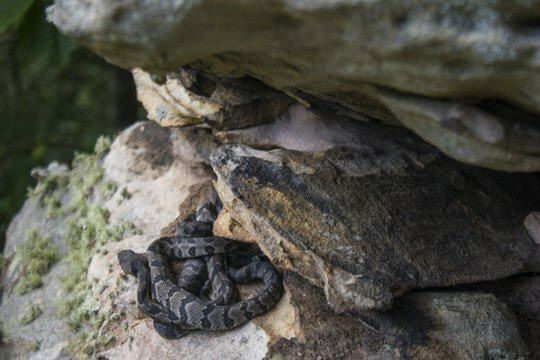 About the time he started thinking that they might be juvenile rattlesnakes, I noticed some previously unnoticed snakes laying in the grass a couple of feet from Tim's pack. Thankfully, we had already discussed how I would deal with bees and snakes respectively if we ran into problems, so when I told Tim "Don't move," he had a good inkling as to what was going on. I moved back closer with my camera to get some pictures while Tim moved away from the snake den. The worrisome thing was that we didn't see mom. Apparently young timber rattlesnakes hang out with mom for a while so lurking somewhere nearby was a much larger snake. My guess is that the rock we were on was actually a snake den. It was obviously hollowed out underneath and there is no telling how many more were down there hiding. Moving on out, we were soon tromping through grass on the trail where it followed the tree line at the back of several large fields. A time or two, we could hear deer blowing and snorting a warning as the invaders passed, but otherwise there was nothing too exciting. The one exception was a butterfly that paused on top of a thistle flower just long enough for me to slip the phone out and take a picture. Thankfully, we were back in the woods before long. The temperature seemed to drop several degrees just getting out of the sun. 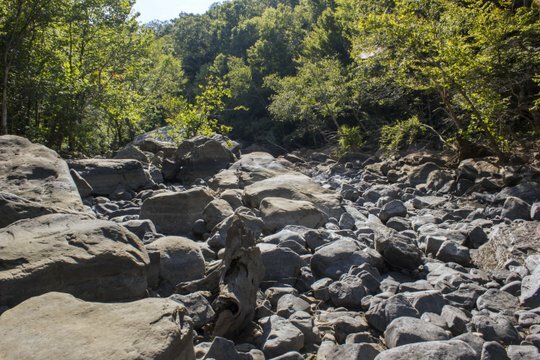 Our next goal was where a tributary called Clifty Creek hit the main river. Here I hoped to find some of the last water for several miles as you head downstream. We finally broke out of the woods and into the streambed. 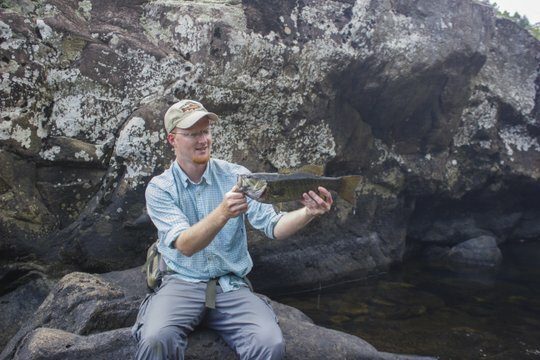 Sure enough, a trickle of water cascading over the rocks fell into a large pool that obviously harbored a good fish population. Casting about for snakes, we soon settled on a good lunch spot on top of a large flat rock where we could watch for danger approaching before it got too close. Those rattlesnakes were still on our minds but other troubles were brewing. I had just sat down and started digging out food. Tim also sat down but was intently looking at his legs and ankles. I took a quick glance at mine before starting to eat. Finally, I turned to Tim and asked what he was up to. "Oh, I have a lot of ticks," was the reply. When I told him I didn't have any, he told me how small they were and showed me an example. That was when I got nervous. Sure enough, I had quite a few, but nothing compared to the well over 100 that Tim pulled off of his pants and ankles. They were everywhere, including walking up our arms. I hated to think about the chiggers that had also probably found me. After battling the ticks for a while, I was ready for some food. I finished my meal about the time Tim was starting his and quickly threw together the Tenkara rod and added a hopper. The smallmouth bass were waiting practically at our feet, obviously hungry, and I knew it wouldn't take much. Sure enough, I quickly picked up a small fish. The exciting part was the larger fish trying to eat the little guy I had hooked! Letting the little guy go, I moved slowly down the pool. Soon another fish hit and this time some much larger fish tried to eat it! The pool was too low and calm, however, for this commotion to not bring about some caution in the rest of the smallmouth bass population. I tried some other flies, but the shadows were already growing and we had several miles to go. One of the most epic days I've had the privilege of enjoying on the water happened earlier this summer when my buddy Jayson was about to get married. Another friend and fellow groomsman, Pat Tully, along with myself and Jayson took a day to float the Caney Fork River to celebrate his upcoming wedding. The day turned out better than I could have imagined with the groom-to-be catching two 20"+ fish, and Pat and I caught some great fish as well. Fast forward a little and you will find me looking forward to hosting Jayson and his bride Hailey on the drifter again for another trip down the Caney Fork River. 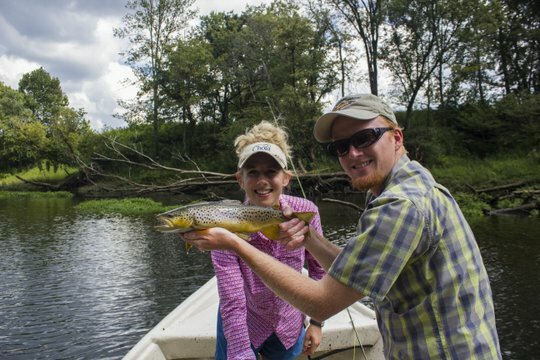 When discussing the trip, Jayson made it clear that he wanted Hailey to catch a big fish. True to his word, upon arriving at the river to start our float, he quickly jumped in the back of the boat and Hailey was in the front casting brace ready to hunt some large trout. The water cut off right on schedule which was a pleasant change. Lately the Corps has been inconsistent with the water shutoff time. That can make for some frustrated waiting at the beginning of a float trip. Thankfully we weren't waiting at all on this day. Both rods were already rigged and ready so after parking the truck, I was back down to the water and settled in at the rower's bench in no time at all. I handed Hailey and Jayson their respective rods and we pushed off into the current. 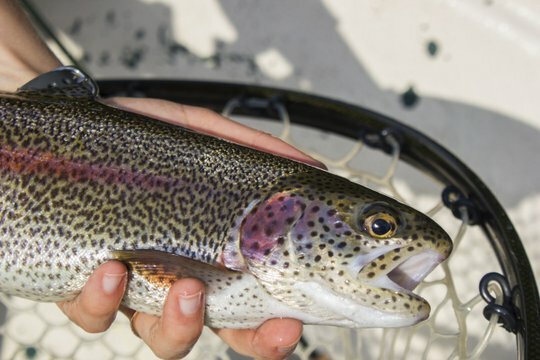 Before long, we were bringing some nice trout to the net including an early double. We had to take a picture of the double for the newlyweds. I think they were having fun! Moving on down the river, both Jayson and Hailey were casting right where I told them and getting some great drifts. The wind was up a little which meant that both anglers and the guy rowing had to work a little harder, but the fish didn't seem to mind. If anything, I think they were feeding even better than normal. Moving on down the river, we were approaching a spot where I had recently spotted a large brown trout. Directing both of them to get their drifts started early, I moved the oars at the right time and the boat was perfectly positioned as it came over the shoal. Suddenly, Hailey's strike indicator shot under and the battle was joined. I was already going crazy with the possibility that we had found the big brown trout. The big flash when the fished rocketed towards the surface told us that, instead of the big brown, she had found one of the great rainbow trout that are in the river right now. The fish was hot and for a while it was touch and go if we would land it on the #20 fly and 6x tippet. 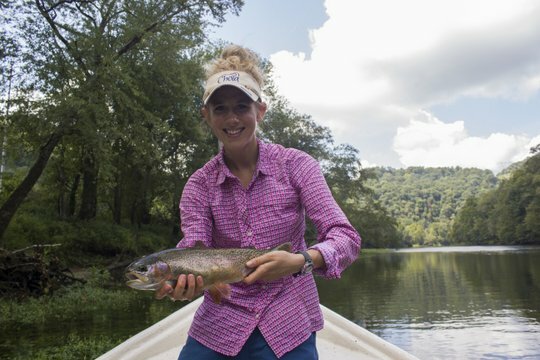 Hailey did everything perfectly though and before long got her picture taken with the big trout she had come to the Caney Fork River to catch. We made another pass over the shoal but then kept on moving down the river. As we were drifting, we started to notice a roaring sound down the river. Lately the river has been inundated with various power boats and this jet boat was no exception. A lot of these guys are polite, but several have been roaring by with no thought for the large waves they throw as well as the discord in an otherwise quiet day. Thankfully, these will not be on the river for ever. A certain element within our sport seems to show up only shortly prior to and during the spawn. I would rather catch my big fish under normal conditions but a few people seem to only show up when fish are at their most vulnerable. 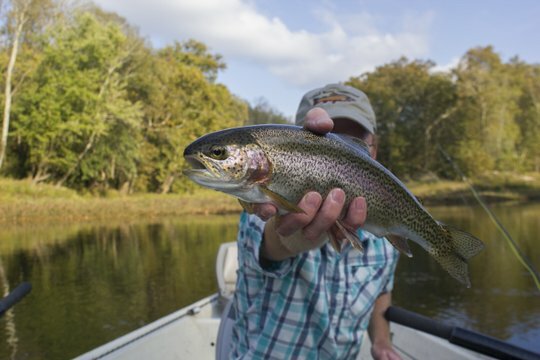 If you are interested in catching these fish under fair conditions, consider a float in my drift boat as I know where these fish are as well as what they are feeding on year round. 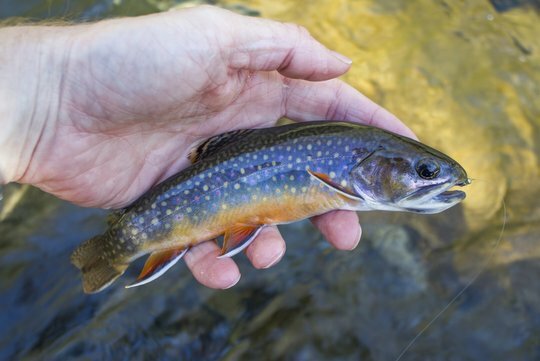 If you must fish for spawners, please respect the fish and keep them in the water. 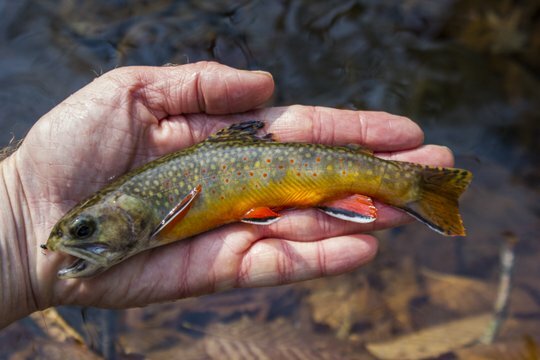 Above all, do not keep any trout caught during the spawning season. With the shoal we had been going to catch our next big fish on shot by the jet boat that took a couple of passes over it, we had to adjust our plans a little. It was getting late so I decided to do lunch and give the water a little time to rest. 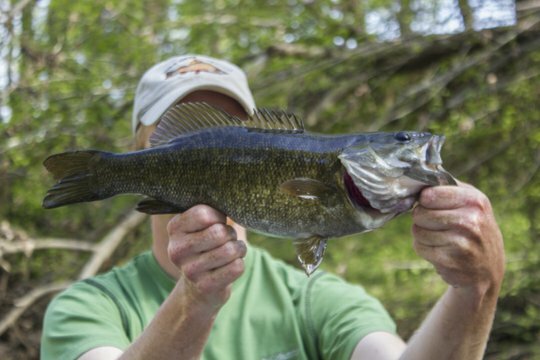 Loud motors have a way of spooking the better fish in the river. We enjoyed our lunch of sandwiches, chips, and my famous Greek pasta salad. Jayson was extra excited about the chocolate chip cookies to chase everything down with, and I discovered that it was his favorite sweet. I was glad that he was happy and content because Hailey was well on her way to owning the day from a fishing perspective. Jayson was still catching fish, but Hailey was finding all of the quality fish. After lunch, we pulled back out in the current and started drifting again. Almost immediately Hailey tied into a really great fish. I chased the fish up and down the river and she did everything correctly. 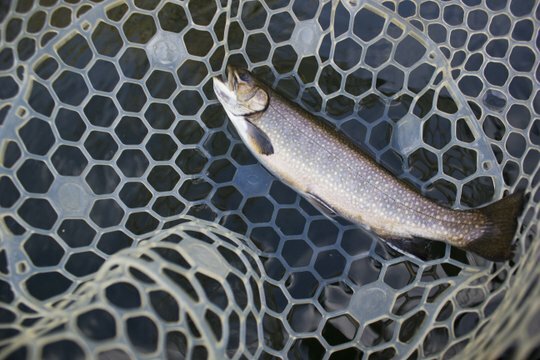 Before long, we had a really nice brown trout in the net. Meanwhile, Jayson was in the back of the boat still working on catching the little guys. We continued to enjoy our float, with the jet boat passing us at least twice, throwing a big wake and not slowing appreciably either time. Both times we continued catching fish but not the big guys. Those fish were well under cover by this time. Late in the float, I offered Jayson the chance to enjoy a treat. The dry/dropper fishing with midges has been phenomenal in one particular stretch and I handed him the four weight ready to do business with those trout. 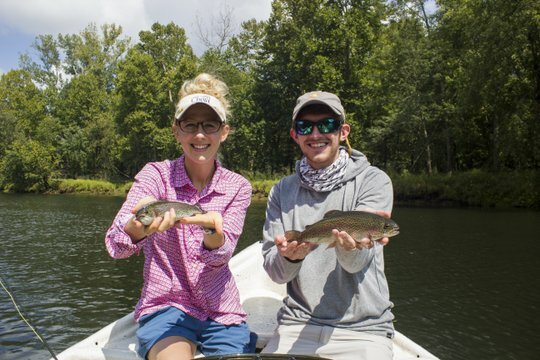 Late in the day without the pressure of wanting Hailey to catch large trout since she had already cleaned up from the front of the boat, Jayson put on a clinic. He caught several really nice fish until it was determined that the hour was late and we needed to leave. Thanks again for an enjoyable day Jayson and Hailey, and I hope it is the first of many fun times for you in the drifter together!